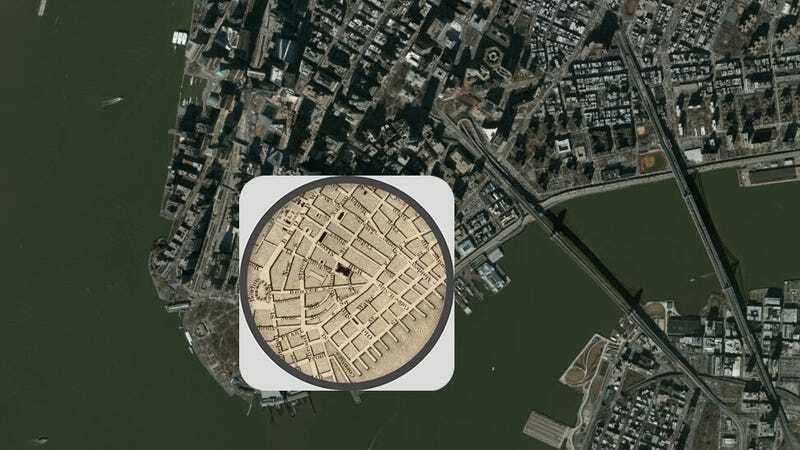 Travel back in time with this interactive map of New York, which lets you take a spyglass to any part of the city and uncover what that circle of space looked like in 1836. David Rumsey is a map expert and collector, and he calls this wall map, drawn by Joseph Colton, one of his favorites. The Smithsonian combined this map from Rumsey's collection with satellite images of modern New York to show how the city has changed over the last 175 years—notably, how much of the island of Manhattan consisted of wide open spaces. This is just one map in a series of maps looking at the alterations of American cities. The Smithsonian also has maps comparing modern Chicago to Chicago before the fire, Los Angeles today to the much smaller city it was in 1880, a realtors' view of 1879 Denver to an era in which even the path of the river has changed, Washington, DC before and after it expanded into the Potomac River, and present-day San Francisco to 1859 SF, before earthquakes and man-made turf altered the city.